I’m honored to share this episode #32 of the podcast with Chandra Brooks, who has become a friend and a generous thought partner for me in recent months. Chandra is a wife, mother of four, a grandmother, author, entrepreneur and the Northern California Staff Director for SEIU-United Service Workers West. Born and raised in San Jose, CA, she’s passionate about civil rights, social justice, and improving voter outcomes and civic engagement in communities of color. She’s also an appointed commissioner for Santa Clara County’s Commission on the Status of Women and Girls, Chair of the Justice and Advocacy Committee and elected Delegate for The California Democratic Party. In 2017 Chandra launched The SocialPreneur, a purpose driven business that prepares potential candidates to run for political office and mentors women to own their power and leadership within their company, business, and/or community. 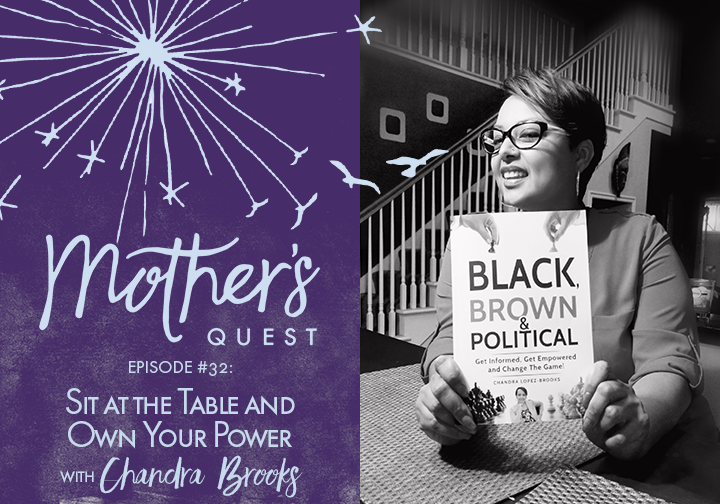 I reached out to Chandra because I wanted to talk with her the week that she released her new book, “Black, Brown & Political: Get Informed, Get Empowered and Change the Game” which provides easy to navigate tips and inspiration to help women of color get involved in local politics. In this episode, we got to dive deep into the influences which drove Chandra to own her voice and reach her fullest potential. She shares how her mother led her by example to stand up for herself as a woman at a young age and how her uncle unknowingly sparked her to strive for greatness after he doubted her future success when she became pregnant as a teenager. And, we uncover how Chandra’s ambition, value for education, and commitment to political leadership helps her inspire generations today, from her 12 year old son to the women she mentors, to sit at the table and own their power. I didn’t realize when I scheduled the interview with Chandra that we would be talking the day before the November 2017 elections. The conversation couldn’t have come at a better time, and her challenge inspired me to go out and do another round of precinct walking with my 5 year old that afternoon. It was thrilling to wake up the next day to news that so many women of color, including one woman my son and I had supported the day before, had been elected. Chandra, with her new book as a resource, is a powerful force to fuel this growing movement of women stepping into more leadership. I hope this conversation will inspire you, as it has me, to be part of this movement and to more fully own our power to make a difference. The lack of access Chandra witnessed to vocational training and education for women in a local prison, compared to the men, and how she’s using her leverage as Commissioner to change that. What happened when Chandra’s uncle told her “Your life is over, you might as well prepare to be on welfare” after she announced she was pregnant as a teenager. Black, Brown & Political: Get Informed, Get Empowered and Change the Game! Get involved as a leader in your local community.. Join a school board, commission, or neighborhood association. Use your influence and privilege to support communities in need and leaders of color. 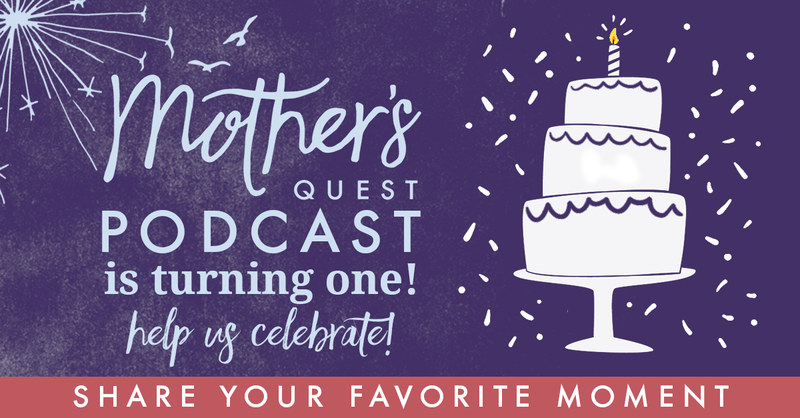 A year ago on December 1st, I launched the Mother’s Quest Podcast as a birthday present to myself. It’s hard to believe that another personal birthday and the first birthday of the podcast is almost here. I’d love to celebrate by highlighting your stories and how the podcast or Mother’s Quest Community has helped you to live your E.P.I.C. life. Go to mothersquest.com and use the speakpipe tool to leave me a 1-2 minute message for a chance to be featured in this season’s finale. Everyone who submits will also be entered into a drawing for a free signature coaching session from me and some other prizes from other amazing moms in the Mother’s Quest Community. Can’t wait to hear your stories and celebrate with you. I’m honored to have shared two episodes in a series of conversations for the Women Podcasters in Solidarity Initiative. I created the Initiative to build awareness and raise dollars for Anti-Racism and the Movement for Black Lives. My plans for the Initiative culminate the last week of November, with a final episode and a personal contribution and invitation to you to support this cause financially on Giving Tuesday. If you want to make sure you stay informed, take a moment now to get connected, whether that’s through subscribing to the podcast, joining the Mother’s Quest Facebook Group or signing up for the email list at mothersquest.com. I look forward to sharing more. If the description above sounds like you, the Virtual Mother’s Quest Circle Pilot, may be right for you. This signature offering provides inspiration, coaching and community to spark your E.P.I.C. life with intimate virtual reflective sessions over 3-4 months. I’ve been there, I’m still on the journey myself, and I’d love to bring all I’ve learned from a decade of coaching, 13 years of motherhood and all the lessons from my podcast guests to support you. Send me an email at julie@mothersquest.com if you’re interested in learning more.